As micromachining is finding a lot of applications in various fields such as biomedical, avionics, optics, and electronics, it is necessary to produce parts with good surface finish and minimum burr. 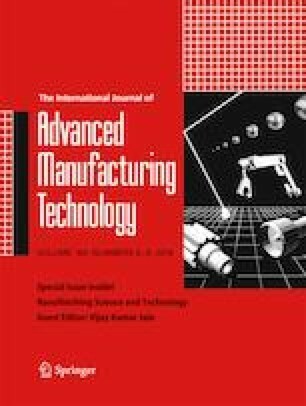 In this paper, experimental investigations on the effect of spindle speed, feed and depth of cut on various responses such as surface roughness and top burr formation during the micro milling of Ti-6Al-4V with two different carbide tools with a diameter of 0.5 and 1 mm have been carried out. Three levels of cutting parameters with full factorial design were used for the experimentation. The burrs formed on the up milling side of the micro slot were analyzed in this study. A scanning electron microscope (SEM) was used to analyze the burrs formed and was quantified in term of its kerf width. The analysis of variance (ANOVA) was used to find the level of significance of cutting parameters on surface roughness and top burr formation. In addition, statistical predictive models were also developed to predict the responses in terms of cutting parameters. Finally, a cutting strategy was postulated to minimize the top burr in the micro end milling of a slot and was verified for a slot of 0.75-mm width.